158 pages | 2 B/W Illus. 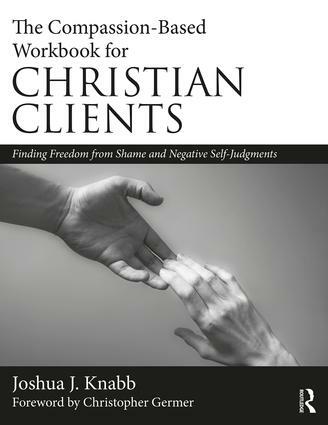 The Compassion-Based Workbook for Christian Clients integrates contemporary research in clinical psychology on compassion-based approaches to shame with a Christian worldview, offering a wide variety of strategies for Christians to better understand and combat shame and negative self-judgments. Chapters lay out a four-step process to help clients let go of unhelpful thinking patterns that lead to shame, experience God’s compassion on a deeper level, and extend this compassion to themselves and others. Readers will find a wealth of Christian-sensitive experiential exercises, journaling assignments, biblical examples, and case examples throughout the workbook. Audio recordings for several guided meditations are also provided to help Christians practice the strategies offered in the workbook. "In this workbook, Joshua Knabb offers a clear, biblical understanding of the transformative power of compassion—for others and for ourselves—and offers a path to fully embracing God’s unconditional love as its greatest model and source. Dr. Knabb clearly lays out skills that will help readers find freedom from the burden of shame while drawing closer to God in the process." "Joshua Knabb has written an excellent and very helpful workbook for Christian clients, one that uses a compassion-based approach that integrates Christian and biblical insights with sound psychological perspectives. The book contains many practical exercises, journaling assignments, and biblical and case examples that are Christian-sensitive—focusing on thinking, feeling, behaving, and attending and imagining with compassion—and centered in a deeper relationship and attachment to God. Highly recommended!" "This breakthrough book brings together the secular, evidence-based tradition of compassion-oriented interventions with the longstanding Christian tradition of divine love to help Christian clients overcome the debilitating effects of shame and develop a compassionate approach to themselves and others based on the Christian’s relationship with God. Based in sound Christian theory, supported by research, and including many practical exercises, the book will be a godsend to Christian therapists and their clients." Joshua J. Knabb, PsyD, ABPP, is director of the Doctor of Psychology (PsyD) in Clinical Psychology Program and associate professor of psychology in the College of Behavioral and Social Sciences at California Baptist University. He is also author/coauthor of three previous books for Christian clients: Contemplative Prayer for Christians with Chronic Worry (with Thomas Frederick), Acceptance and Commitment Therapy for Christian Clients, and Faith-Based ACT for Christian Clients.